The gun conversation in this country has real, systemic problems. In my first story on Medium, I unpacked some of the ways in which the left of center media is warping statistics to fool people about the real problems of gun violence with misleading graphs, out of context figures, and obfuscating rhetoric. To be explicitly clear, the right of center media does the same thing, in different ways. I chose to highlight the efforts on the left for two reasons. One, I have many friends who identify with the left, who are intelligent, rational people, and who keep falling for these tricks because of their inherent predilection to accept things they feel should be true. But more importantly, the left has really gotten this gun policy thing completely backwards, numbers-wise, and if they don’t sort themselves out over it, it’s going to tremendously harm their political position over the long term. They are so fixated on a particular solution, that they have a tremendously difficult time even properly formulating the problem itself that they’re trying to cure. To properly defend a policy proposal requires a series of steps. We first define a problem, then show the case that it is in fact a problem, then propose a plan to fix it. We show that the plan has solvency. Finally, we weigh the relative advantages and disadvantages of it. The left of center media literally can’t get out the gate on this process. They can’t even formulate the case, because the tricks they’re playing with the data interfere with their problem definition, and some of the data sets themselves undermine their general plan of “take the guns somehow.” So let’s ignore their plan, let’s make their case for them, and let’s use data. First let us presume death is bad. Since this is a story arc about guns, let us presume that it’s specifically bad when people get shot by a gun. Let us further presume that it’s bad when anyone gets shot, so we don’t get stranded in an argumentative rabbit hole weighing the relative merits of one life versus another. These are presumptions on which that the left and right generally agree. These presumptions lead us to the case: “The United States should do something to reduce the number of gun deaths.” Now we must defend the case, and explore the facts about those gun deaths, to lead us to a solution with efficacy. You’ll note we chose the term “gun deaths.” In the prior article, I point out how gun homicides are not at all correlated with gun ownership, but suicide is, and the “gun deaths” term has been basically concocted by the left as a rhetorical trick. (did you “spot the difference?”) It’s used to manipulate people’s opinions about firearm homicide by including firearm suicide in the data without making that inclusion explicitly clear. But that’s okay! We will use this anyway, because the “gun deaths” problem truly is a bigger problem than homicide alone, and there are a lot of very good ways we can tackle this problem, hopefully without exacerbating these culture wars. Let’s unpack the gun deaths. Suicide is in red on the left, homicide is in blue towards the right, accidents are in yellow towards the very right, and there’s some grey for ‘undetermined’ data points. Go there, play with it. They have a nice UI, but when I go there I find myself desperately seeking finer grained data. Herein, I attempt to scrape, compile, and intuit approximations of the finer grain so we can see the problem. The first thing we see from our dive into FiveThirtyEight is that suicide is twice the problem homicide is. Men outnumber women in suicide rate by a factor of three to one, but they outnumber closer to 7 to 1 in gun suicides, which is our topic. That’s a large difference, owing partially to men’s proclivity to choose more violent methods of suicide, and partially to men making up 62% of gun owners. The extent of the gang homicide problem is something the right leaning media gets significantly wrong, in my research. This JPFO article, for instance, claims that gangs are 80% of gun homicides, and that figure was repeated by ABC, and is often cited by the NRA and others. It appears to be explicitly false. Even in hotbeds of gang crime, the ratios rarely crack 50%. The National Gang Center does the best job available of tracking this number, and pegs it at around 13%. We also have difficulty determining how many homicides are drug war related, because the record keeping is not universal, nor even are the definitions. The CDC seems to indicate that the rate varies between 5% and 25%, and the Bureau of Justice figures it’s around 15%, so we’ll use that. Mass shootings are miniscule in this number, and not noticeably on the rise, and mass school shootings are such a tiny fraction of our stated problem that they are literally not worth considering in this analysis. That sounds terrible. I get it. But consider this. On average, around Ten students are killed per year by gunfire at school. Fourteen times more kill themselves, on purpose, with guns at home. Willingly leveraging the tragic deaths of the latter group to push policy about the former group is disgustingly disrespectful behavior. Everyone should stop doing it. Especially when the policies being pushed have no efficacy. So let’s plot these things out. Where am I cheating in this visualization? 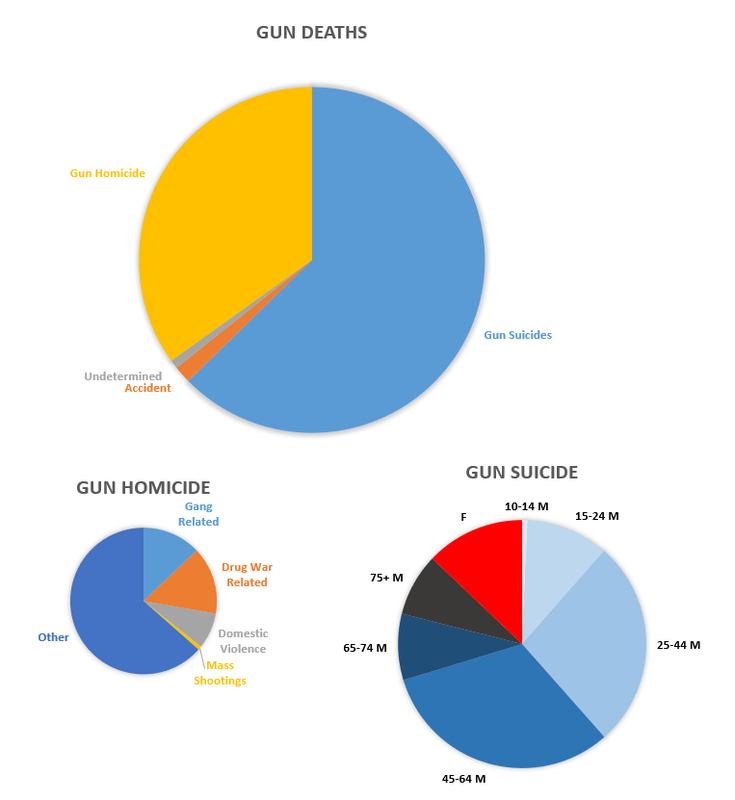 One: I sized the homicide and suicide pie charts to be relatively equal to their representatives of the total gun deaths number, but I did it by eye, so the visualization may not be exactly correct on an area weighted basis. Two: I only had a breakdown of men’s overall suicide by age, not specifically “firearm suicide” by age, so I extrapolated on the age breakdown. Might not be a great assumption, but probably not a terrible one. So let’s take a look at the implications of the data. Male suicide by firearm is about 20 times more prevalent than domestic homicide of women. Almost twice as many males in the 25–44 age bracket kill themselves as all drug and gang homicide combined. Intentionally killing yourself with a firearm is over 38 times more likely than accidentally killing yourself with one. And mass shootings make up 0.3% of the overall problem. Mass school shootings make up 0.03%, a ratio so small I couldn’t even graph it. I intend to return to the homicide problem in a later article, but you cannot treat “gun deaths” as a problem without first, most importantly, treating the lions share of the problem. The overwhelming problem with gun deaths is gun suicides. And the overwhelming problem with gun suicides is men in their professional years, ages 25–64. Men between those age ranges intentionally taking their own lives, in their own homes, constitute 37% of the entire body of all firearm deaths. I find it frustrating and counterproductive that after each mass shooting incident, the media on the left attacks men, repeatedly. But I find it even more ironic that the media doesn’t do near as much damage to men as men do to ourselves. The left of center media is standing on a pile of dead professional aged men, who took their own lives, and is using their deaths to push a rifle agenda completely unrelated to their deaths. Why do the media outlets fail to identify the bulk of the “gun deaths” problem? It’s possible that they’re simply dumb, or careless, but I doubt it. It’s possible that pointing it out wouldn’t be profitable, because it wouldn’t drive clicks from their target market. Or it’s also possible that sympathy for men simply does not fit within the prevailing Blue Church narrative. Pointing out the truth about the data would create too much cognitive dissonance, so it is selectively and intentionally ignored. Instead, we are presented with a view as if men slaying children indiscriminately is commonplace, instead of the predominant truth — mostly it’s men slaying themselves. If we are going to put together a plan to ameliorate gun deaths, then suicide prevention must be the overall cornerstone of the plan. The case for this is clear, and data driven. · Magazine size restrictions: You only need a magazine size of “one” to kill yourself. · Waiting Periods: Statistics do not show that people buy guns to commit suicide, as far as I can find. They’re either going to use one they already have, or choose a different method. · Banning certain classes of firearms, such as semi-automatic rifles or handguns: You only need the most basic functioning firearm possible to kill yourself. · Tax bullets: You only need one bullet to kill yourself. · Blanket gun confiscation: Won’t work, and they admit it won’t work, except all those times when they don’t. · Mandatory gun confiscation of depressed people: Terrible, terrible idea, because it would only cause fewer people to go to the doctor for their depression symptoms, making the problem worse instead of better. None of the usual means and methods proposed by the left work for this problem, which is the biggest problem. To formulate our plan, let’s look deeper into ancillary research on this problem. Why is there a gender divide on suicide at all? Well, it varies by region. Europe has a worse ratio than the US does, at 4:1. The Eastern Mediterranean has a low ratio (1.1:1) because it has fewer male suicides, while the Western Pacific has a low ratio (1.3:1) because it has more female suicides. Studies seem to indicate that this is a cultural thing. There’s a possibility that raw biology factors into the conversation. Hormonal swings influence mood swings, and testosterone moods tend towards violence. Ordinarily, juicing people with testosterone to see if they get more suicidal would be completely illegal in medical science, but researchers of the male birth control pill did exactly that, completely by accident. Twenty men in the male birth control pill trial quit in part due to hormonal mood swings, one committed suicide, and another attempted suicide. Other studies have also shown this link, including studies examining the medical treatment of transgender men. Let me be clear, however, that there’s no clear evidence to my knowledge that testosterone therapy for aging men increases suicide. Jury is out on this, but I felt I’d mention it. If you know of more research in this area, please comment below. The multivariate analyses on firearm suicide are good, and give us some indication of what we can do, but only if we look closely at what those analyses actually mean. Here is a good example, by Siegel and Rothman, published in the American Journal of Public Health. Before we dig deeply into it, let’s remind ourselves that in providing properly attributed online commentary and critique of their research, this article falls under the “fair use” provisions of US copyright law. Also, I roundly endorse following the link and paying them some cash to access the entire study. Or buy them a beer. Send flowers. Whatever. It’s a good study. Results. 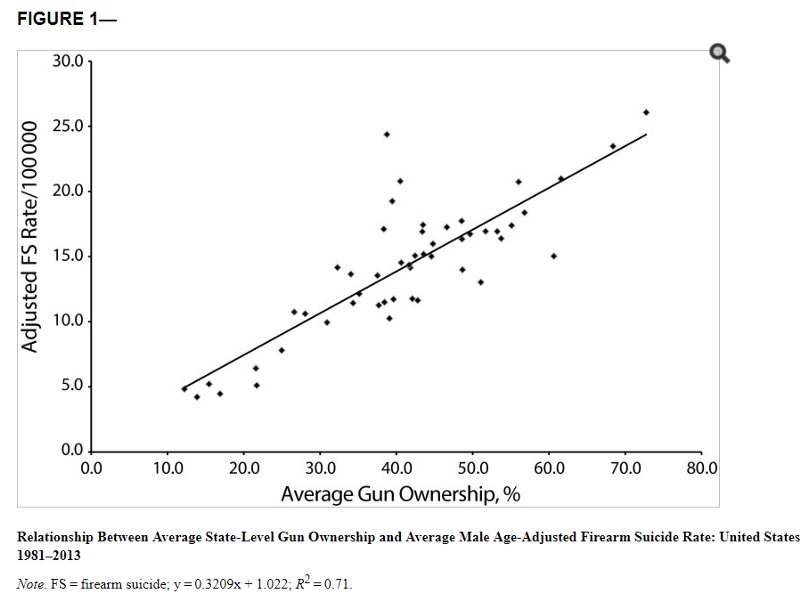 State-level firearm ownership was associated with an increase in both male and female firearm-related suicide rates and with a decrease in nonfirearm-related suicide rates. 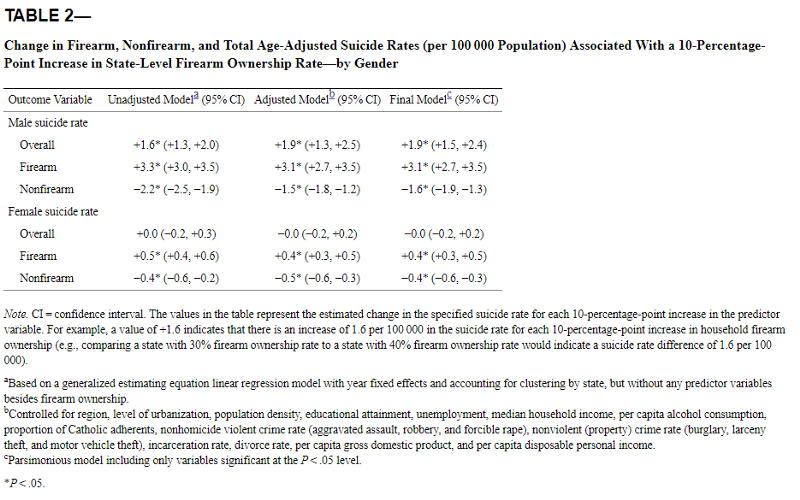 Higher gun ownership was associated with higher suicide rates by any means among male, but not among female, persons. Conclusions. 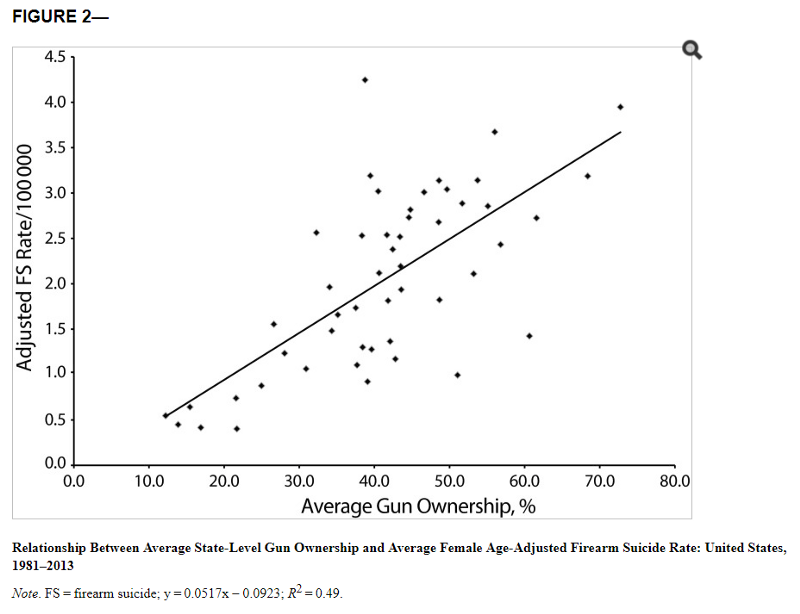 We found a strong relationship between state-level firearm ownership and firearm suicide rates among both genders, and a relationship between firearm ownership and suicides by any means among male, but not female, individuals. In general, I buy this. Their methodologies fall into some of the same traps that others in this space do, namely using an ownership proxy variable instead of actual ownership data. And what’s their proxy? The ratio of suicides by firearm to total suicides. In the end, there’s a bit of a self-fulfilling-prophesy stuff going on with this, when you try and relate suicide rates by firearm to, well, data that’s already linked to suicide rates by firearm. But they did their best to control the proxy, by including hunting license data as well. They seem to think they did a good job, and I’ll leave it to their peers and the global peanut gallery to decide that. Both of these have trend lines which are reasonably correlated with the data, so that’s nice. They’re the sorts of things that the left of center media likes to reprint while waving their hands and screaming “See! Suicides go to zero if guns go to zero!” Well, no. Firearm suicides would go to zero, because people would be forced to choose another method to commit suicide. Siegal and Rothman acknowledge this. Although they don’t give us the money graph that we really want — overall suicide vs firearm ownership rate — they do give us a table indicating some connections. Let’s unpack that. First, I maintain that if we’re really trying to save people, we should take a look at all of their control variables (footnote b), see which of those are more important than guns, and perhaps tackle those first. That aside, let’s look at what the numbers mean. They claim gun ownership with women really doesn’t impact overall female suicide rates at all. 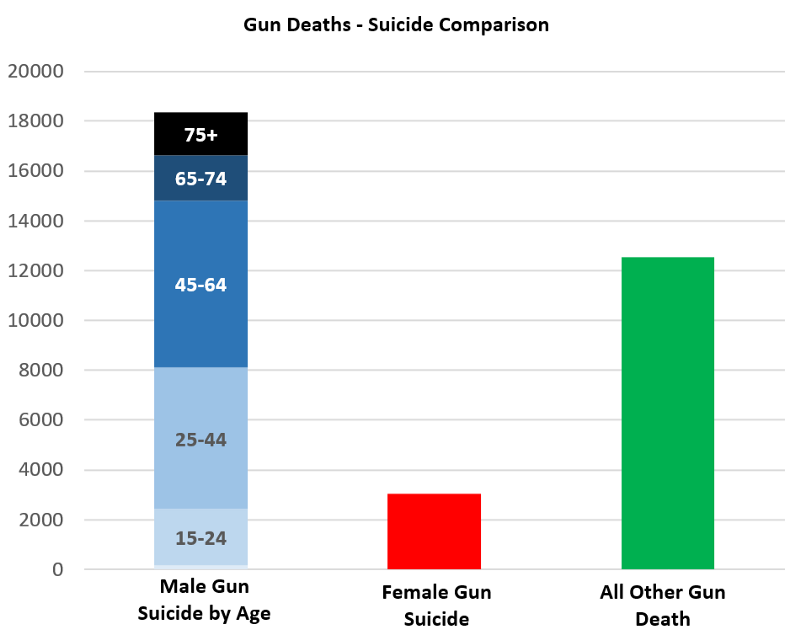 By their numbers, a woman who is going to commit suicide is going to do it whether she has a gun or not, and gun ownership simply moves non-gun suicides into the gun-suicide category. Likewise, lack of gun ownership just means she’ll kill herself a different way. Seems reasonable. Women are a resourceful lot. When discussing the content of this article with my wife, she told me, “If I were suicidal I wouldn’t kill myself with a gun. Who would clean up the mess?” Statistics, meet reality. If 10% more males have guns, then their gun suicide rate goes up by 3.1 per 100,000, but their non-firearm suicide rate goes down by 1.6. So 1.6 suicides per 100,000 simply switch from (other method) to (gun), and then 1.9 additional suicides per 100,000 happen because of the convenience, and the finality, of the gun as a method. Well, maybe. This is a correlative study, and correlation does not prove causation. But we’re going to presume it’s causative for now, because it makes intuitive sense, and also because it allows us to test my favorite hypothetical gun control method, the magic gun evaporation fairy. But there’s no magic gun evaporation fairy. So we’re screwed, because we have to get rid of the 2nd Amendment and send the Ferguson Police Department door to door, risking civil war, to collect all the guns to save all the men from shooting themselves! We don’t need to remove all guns from America to start to see this sort of efficacy. We just need to remove as many as we can from the suicidal people, while not disincentivizing suicidal people from seeking treatment. 64% of the people who attempt suicide visit a doctor the month beforehand. So let’s pretend instead that doctors explained these things to the 64%, and asked them all to voluntarily sequester their firearms, either by selling them off or entrusting them with a loved one for safe keeping while the depression was treated. Let’s pretend half of that 64% do so of their own free will. We’d see the same efficacy as if overall firearm ownership rate dropped by a third in the Siegal and Rothman model. Ownership rates among suicidal males drop from 41% to 27% for the period during which they’re contemplating suicide. Male suicide rates would drop from 14.2 to 11.6, and you save 6,000 lives per year. Slightly less than 1,000 women die from domestic violence per year in this country, and that’s a big, real problem. You can save six times this many men, simply by talking to them, and asking them nicely to sequester their firearms temporarily. The number of people you could save by doing this is double the number of people who die in gang and drug crime combined. It’s sixty times more than die in mass shootings. It requires no new laws, no culture war battles, no erosion of rights. I don’t see 18k saves by reducing male suicide rates by 6.4 per 100k. I see about 10k assuming 150mio males. I double age weighting the data would make up for the gap and at best I think you scaled to us population, not us male population. I have never seen data to show the efficacy of primary doctors asking for guns to be sequestered. At 10k saved possible, a 2/3 intervention rate and 10% it’s still worth it. That’s 600 people who don’t have to die needlessly. But that looks like a lot less or an intervention than 6k. It’s free but I think your numbers are off, and unfounded in this case. It does point out to needing much better male mental health care though.